URM is one of the nation’s largest providers of continuous emergency shelter services. We provide comprehensive care for men, women, and children experiencing homelessness. URM is one of the only organizations in Los Angeles that offers help for single men, single women, single mothers with children, single fathers with children, two-parent families, and even families with teenaged children experiencing homelessness. When someone comes to URM, their first stop is Emergency (Guest) Services to meet their immediate physical needs. Our day rooms provide shelter and rest from the streets. Guests can sign up for beds, eat three meals a day, take showers, get haircuts, pick out fresh clothes, and receive medical care. Counseling from our staff is also available to discuss options regarding our recovery programs or other service providers in the area. Food – We serve an average of 3,000 warm, nutritious meals each day — three times a day, every day of the year. To help meet the special needs of children, we provide infant formula and baby food, as well sack lunches to take to school. Shelter – Each night, hundreds of men, women, and children find a warm bed and safety from the dangerous streets. We house an average of 924 men, women, and children each night, including about 62 families. Clothing – Friends of URM graciously donate clothing for people experiencing homelessness. We distribute this clothing to men, women, and children who may have little more than the clothes on their back. Find out how you can donate clothing and other items. Personal Hygiene – Restrooms, hot showers, and personal hygiene supplies are all available to our guests. We also offer diapers for mothers with children. Clinics – URM has partnered with local universities who graciously donate their time and expertise to provide our guests with services, essential dental care, professional mental health services, and full-time legal aid counseling. Day Center – URM is open every day to provide a safe place for hundreds of men, women, and children with nowhere else to go. We provide separate spaces for men and women with enclosed courtyards and spacious assembly areas that offer a safe, caring environment. Family Community Center – This is a special place where mothers and children can get off the streets and enjoy one-on-one interaction or find a quiet space where a tired toddler can nap or a mother can rock a baby to sleep. We provide books, games, toys, puzzles, and crafts. Hospitality Center – Scheduling a job interview, applying for aid, saving money, or enrolling a child in school are virtually impossible without an address or telephone number. The Hospitality Center helps guests make these important first steps by providing mail, telephone, and banking services. Individual Assessment/Counseling – Counselors assess each individual guest to determine their unique circumstances and needs. We then offer them individualized assistance and referrals for employment, housing, government aid, substance abuse, recovery, and other services. Life Management Classes – Trained staff and community volunteers address a variety of issues and critical needs. Classes include recovery from substance abuse, vocational guidance, parenting skills, nutrition education, and financial management. Spiritual Encouragement – Daily chapel services, Bible studies, and discipleship programs offer the spiritual hope and healing that is essential to building new lives. Families experiencing homelessness can come to Union Rescue Mission for food, shelter, clothing — and much more. We strive to surround hurting parents and their children with loving care and support, and to impart a sense of security and trust so healing can begin. Families are assessed by a multi-disciplinary team of members from the Department of Public Social Services, Department of Child and Family Services, Department of Mental Health and Department of Public Health within the first 1-2 days after they arrive at URM. During the assessment stage, parents are required to present a valid ID and obtain other documentation such as social security cards, immunization records, and birth certificates. Proof of income (General Relief, Social Security, Cal Works, etc.) is also required. Well-child exams for children under 17 are mandatory and access to medical, dental, legal, and mental health clinics is available. After assessment and initial intake, case workers refer parents and children to the appropriate services. Families may be linked with short-term shelter, transitional housing, or permanent housing. 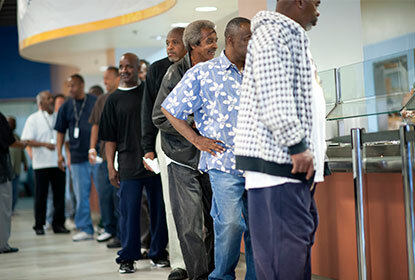 While at URM, families are required to save a minimum of 30% of their income. Employment is strongly encouraged and case managers can provide resources and employment referral. After a maximum of 45 days, once families are linked to appropriate resources and services, they are assisted in moving forward to the next step. One of the referrals in moving forward may be Hope Gardens Family Center. The goal is that no family will have to stay longer than necessary. With the help of case managers, families will be equipped to move forward to long-term services, employment, and housing.